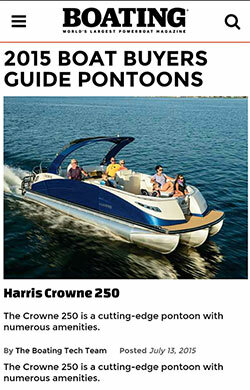 Calling it "a cutting-edge pontoon with numerous amenities," Boating magazine recently featured the Harris Crowne 250 in its 2015 Pontoon Boat Buyers Guide. The magazine's annual guide spotlights picks for "the best new boats on the market." The Harris Crowne 250 is an award-winning pontoon that redefines luxury and style while creating a class of its own. Owners of the Crown 250 can choose from three variations of the dual rear-facing lounger floorplan and an all new SL floorplan with a powered backrest. The first features two elegant, rear-facing aft loungers, two plush boat seats with a wood-grain table, and an amidships lounge. The second floorplan replaces the amidships lounge with a second helm seat to port. The third variation adds an entertainment galley featuring two pedestal seats, sink and wine cellar. Prepare to be noticed ... the world of luxury pontoons has never seen anything quite like this before. Click here to request a free brochure.